After five years and baby number two on the way we were quickly outgrowing our tiny kitchen. 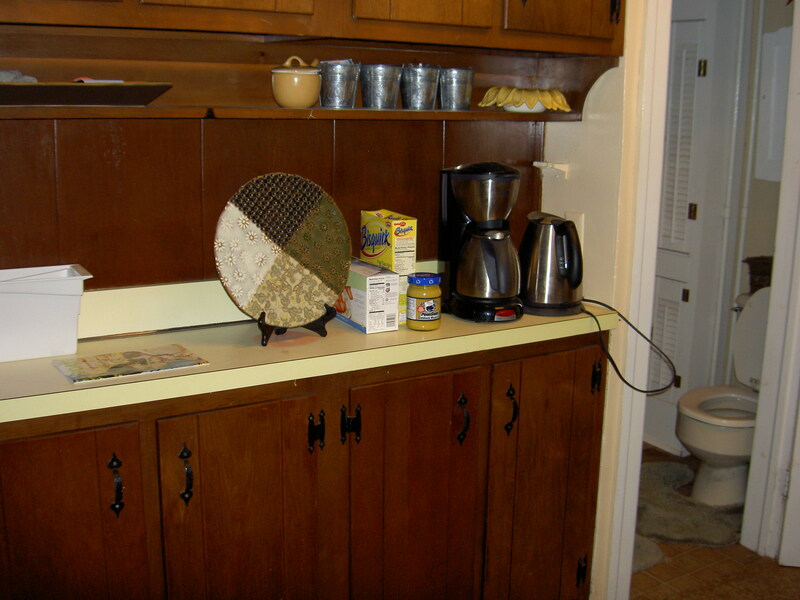 Narrow, warped cabinets, leaky faucets, crumbling flooring and sagging ceiling would send even the most content mom running for the hills. stove with only two working burners. 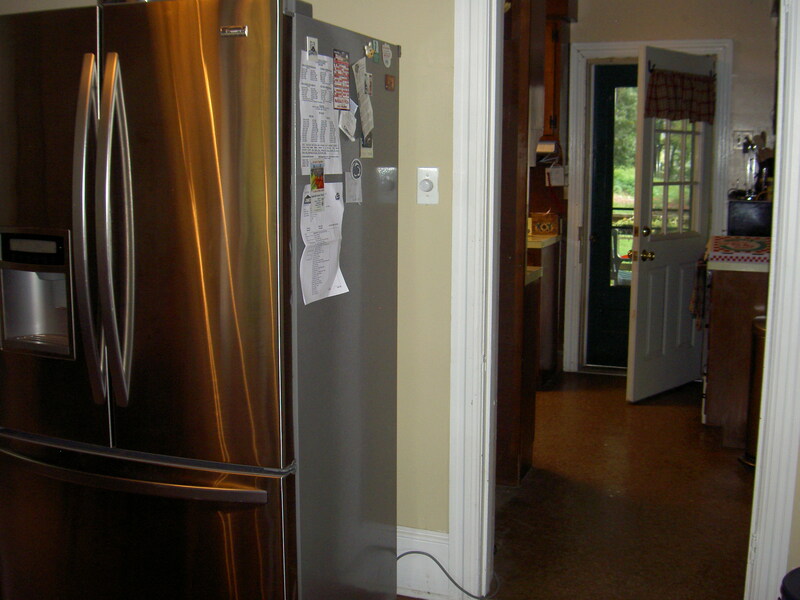 The microwave fit only sideways under the outlet next to the stove. Our previous microwave’s door melted from the cook top heat. 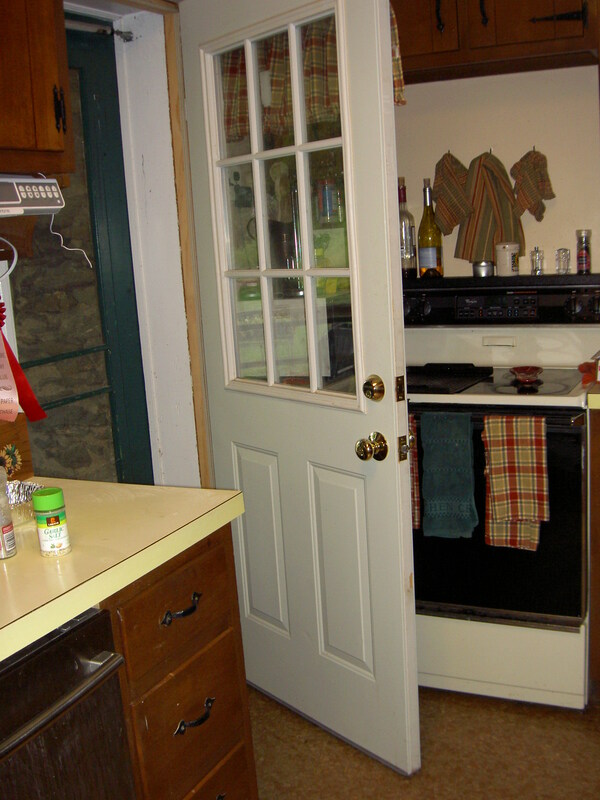 Back door opening into stove. 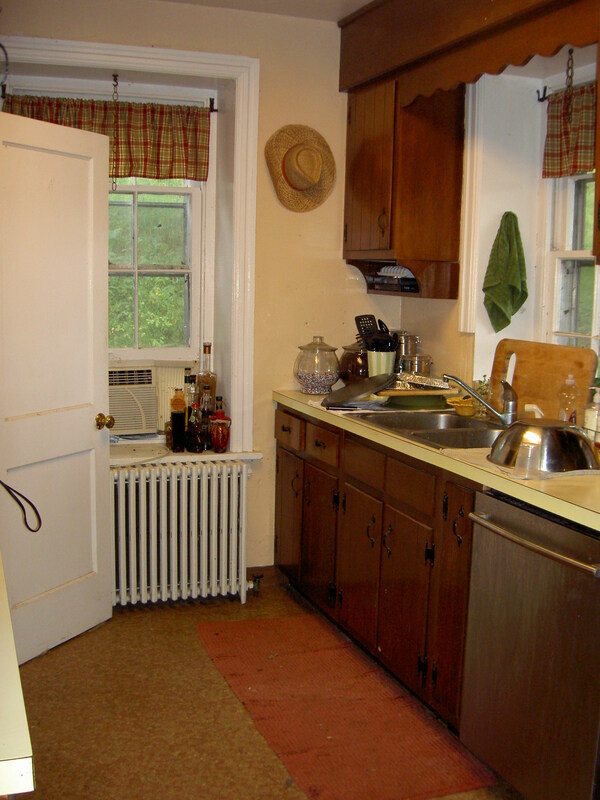 Kitchen sink with deep window behind counter. 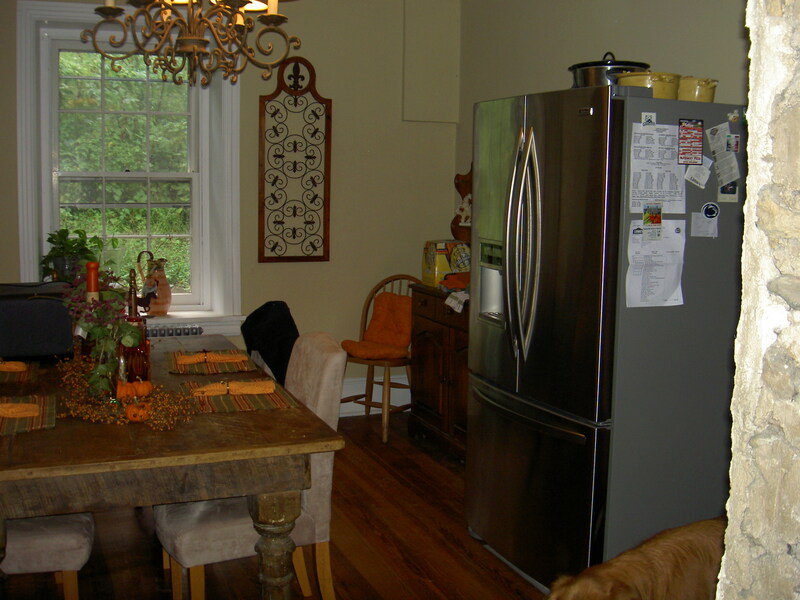 Notice the new refrigerator in our dining room. We saved money by buying it at a scratch and dent outlet, but it would not fit into the previous refrigerator’s spot. 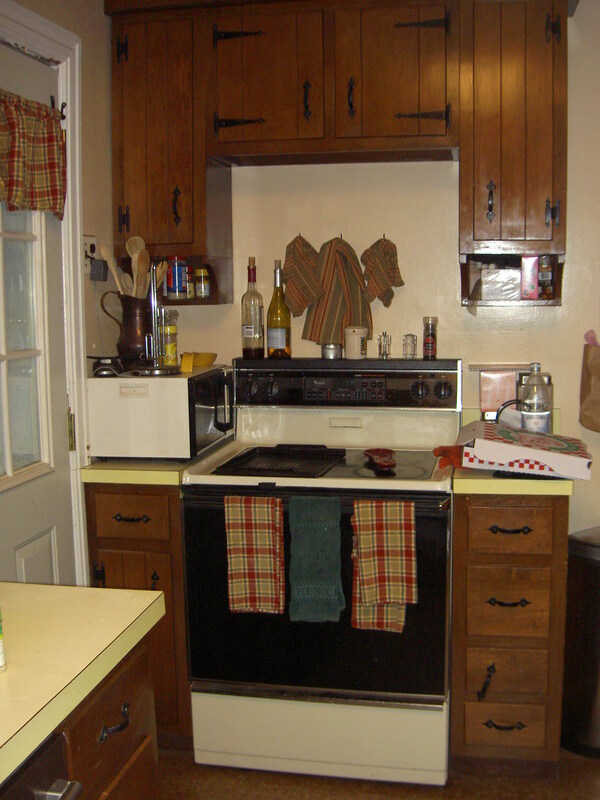 With an old house, you cannot expect to update a kitchen without finding ten other things that NEED to be updated. After living with our new refrigerator in the dining room for two years, we saved up enough to start looking behind those thick walls. We wanted the kitchen of our dreams but knew we had to be prepared to fix any surprises along the way. Entrance to dining room from living room. Gregg put up drywall around the jagged edges to protect our toddler. 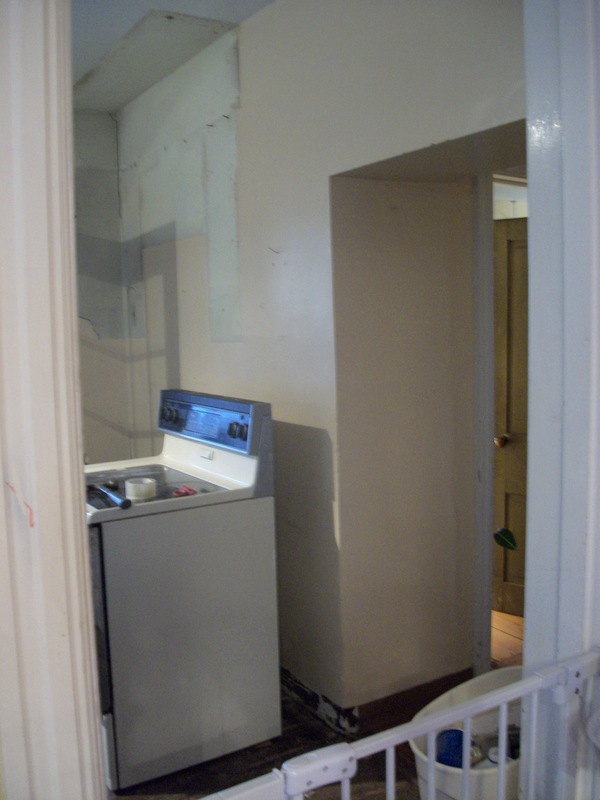 We decided to remove both inside kitchen walls, relocate the bathroom and open up the entry. 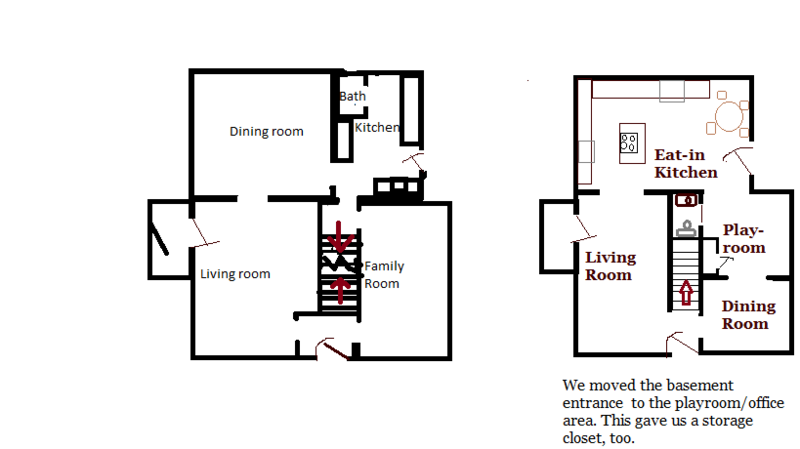 We finalized our contractor’s agreement as we packed up our house. I told a few of my friends I was looking for a place to stay for six weeks. Our friend, Bill, and his new wife graciously let us stay at her house. They had just recently married and a few weeks before had moved her and her children into his home. 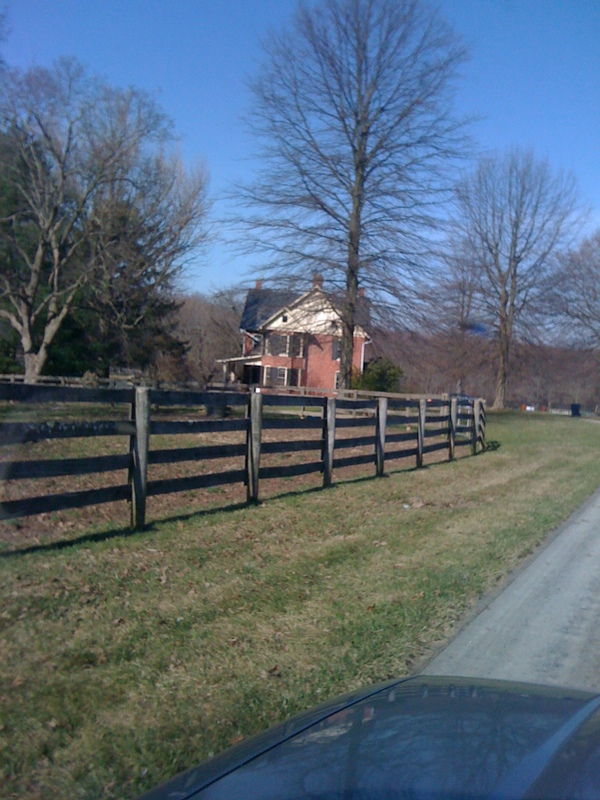 We were blessed to stay at her beautiful 100+ year old farm right around the corner from our house. 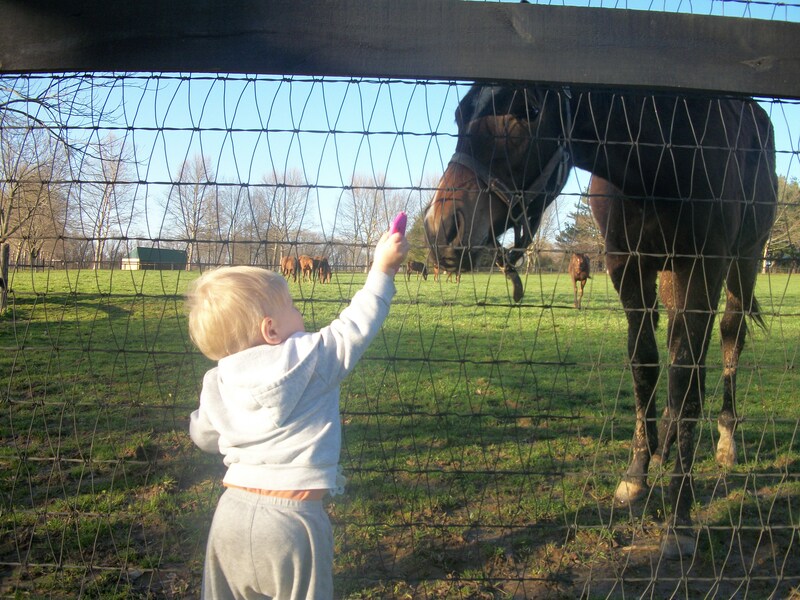 God is great- His timing is perfect (as always!). 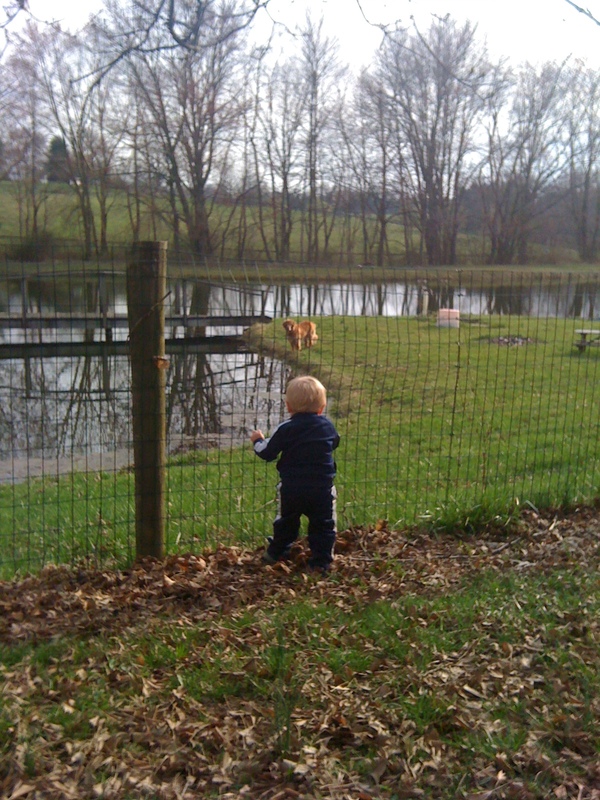 Boomer exploring the pond as C wishes he could climb in, too. Right before renovations began, we were told we had to rewire the entire house to replace all the knob and tube electric. Our insurance agent told us knob and tube wiring had a 49% chance of fire. While 7 months prego, a 13 month old in tow, and trying to keep all the contractor’s on track, I was ready to throw in the towel and book a trip to Hawaii! Instead, I vicariously lived through these inspirational rooms. 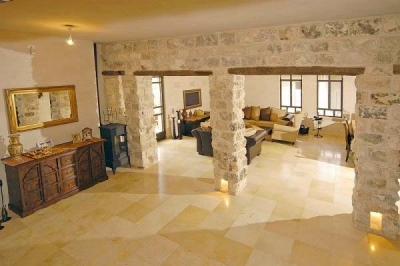 One of my inspirations for incorporating barn beams and rustic stone for the interior. 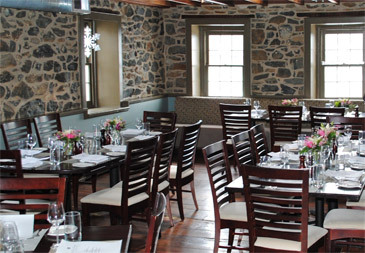 My husband and I went to dinner one evening to a restaurant that recently remodeled their historic building. 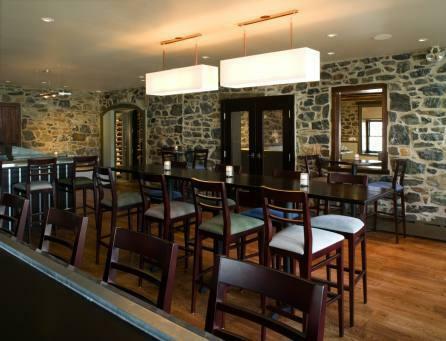 Beautiful mix of rustic with modern elements to create a chic dining experience. 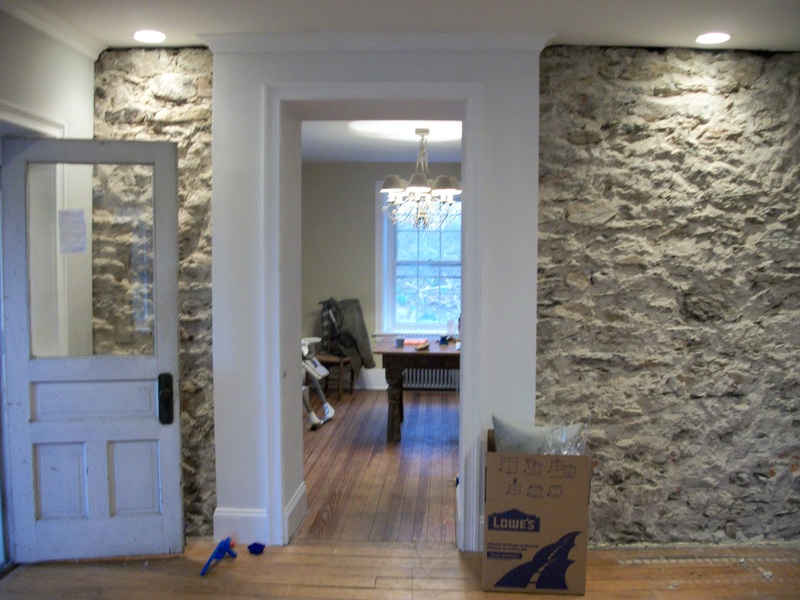 The exposed stone walls provided the perfect motivation we needed to finish our walls. So much eye candy. 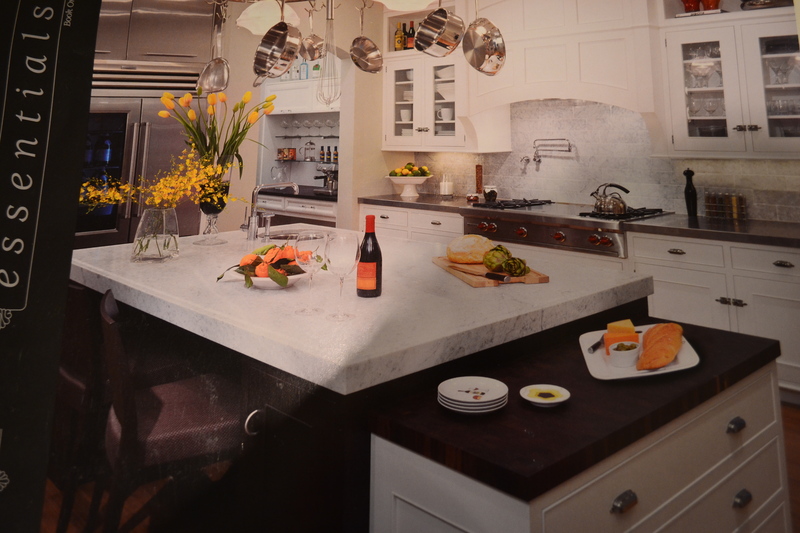 Thick slab of white marble on island, chrome accents, creamy white cabinetry and dark wood elements. I can envision my next cocktail party right here! All that marble makes me smile. Interesting lighting and a dark wood island with white perimeter cabinets. We widened the entrance to the new kitchen (from living room) for a more open layout. 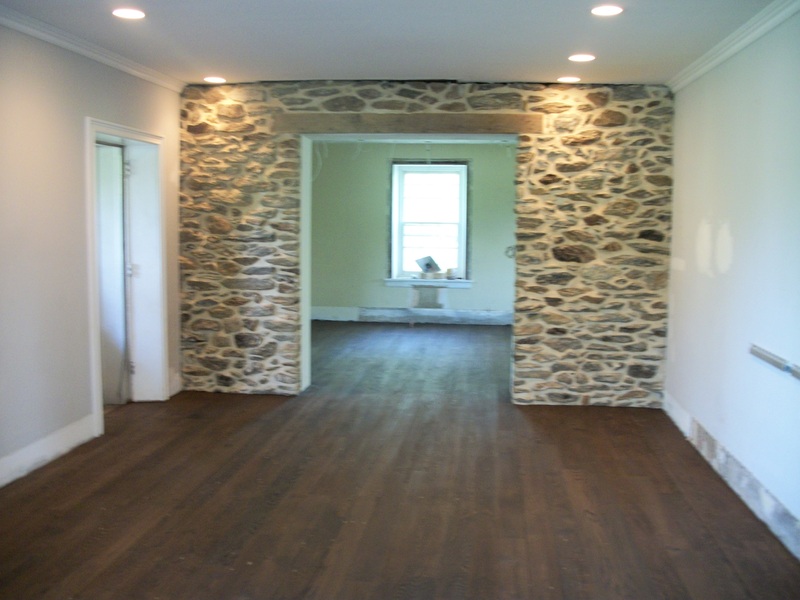 Our contractor found a old barn beam in our barn that he re-purposed for the threshold. G worked nights and weekends running new wiring for the electric and patching plaster. On Friday evenings, we would meet with the contractor to discuss items needing to be completed by us over the weekend to make the contractor’s workload easier for the upcoming week. 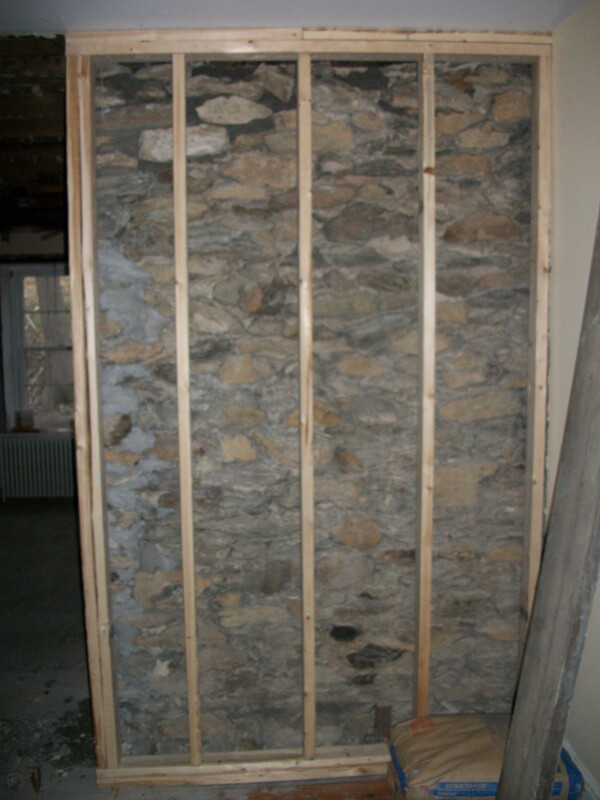 As my belly grew, the rest of the stone walls came down and cleanup began. 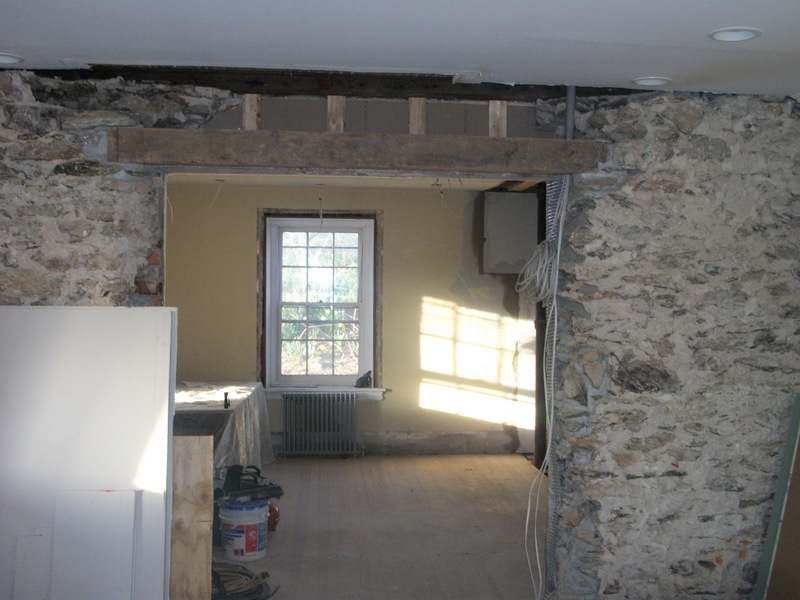 Load bearing wall removed between galley kitchen and old dining room. I would have loved to expose as much stone as possible, but we desperately needed outlets, and studding new walls was the easiest way to add more outlets. 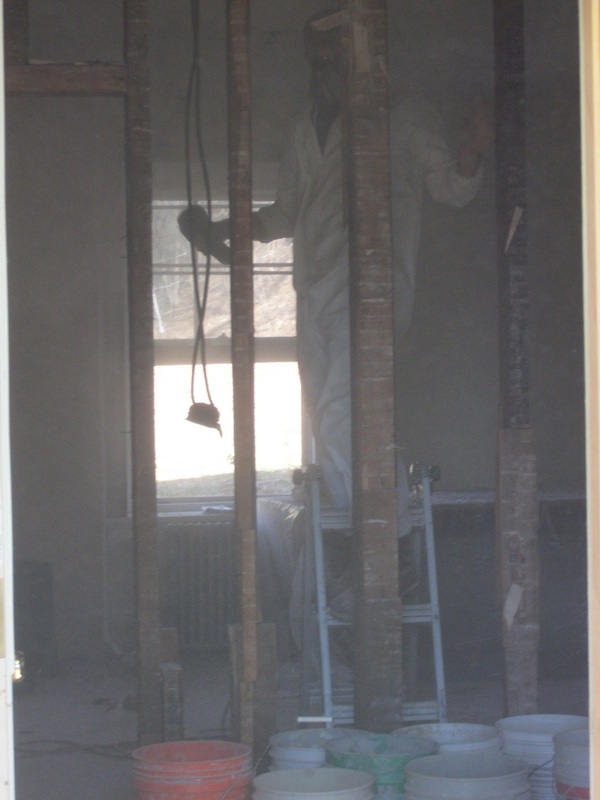 We were disappointed the original main floor boards were laid right over the basements beams. 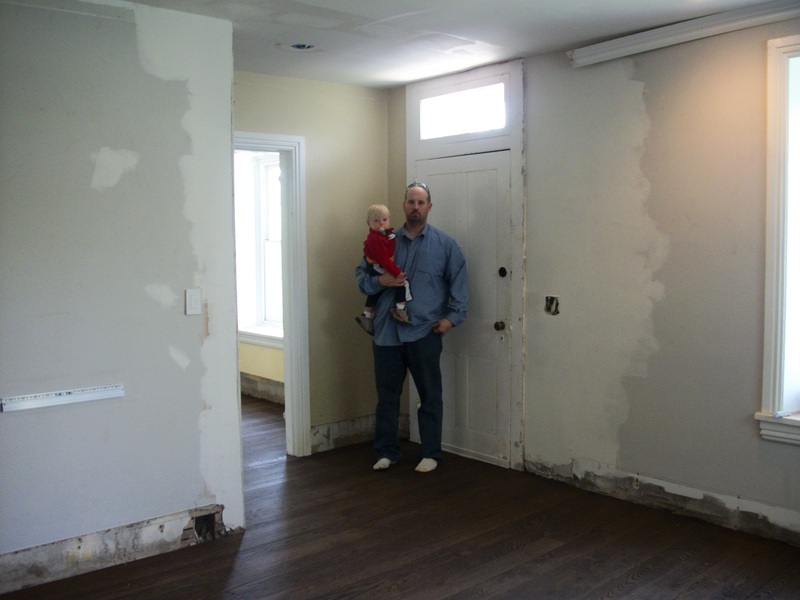 We had no sub flooring and no vapor barrier to protect the house from the damp basement. We hired a flooring guy who sured up the flooring and used it as a sub floor. 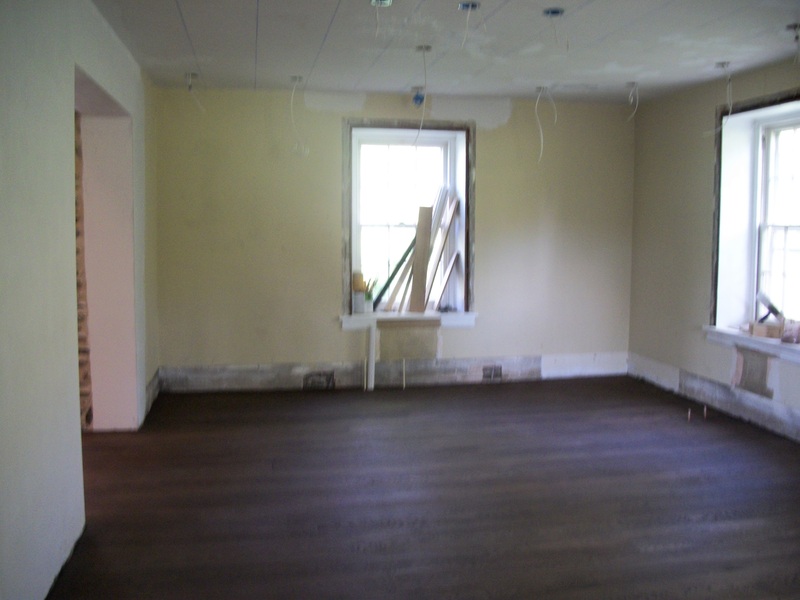 He laid a vapor barrier, and installed 5″ wide white oak flooring then added a dark stain. New half bath and entrance to basement. The open room for our new kitchen! 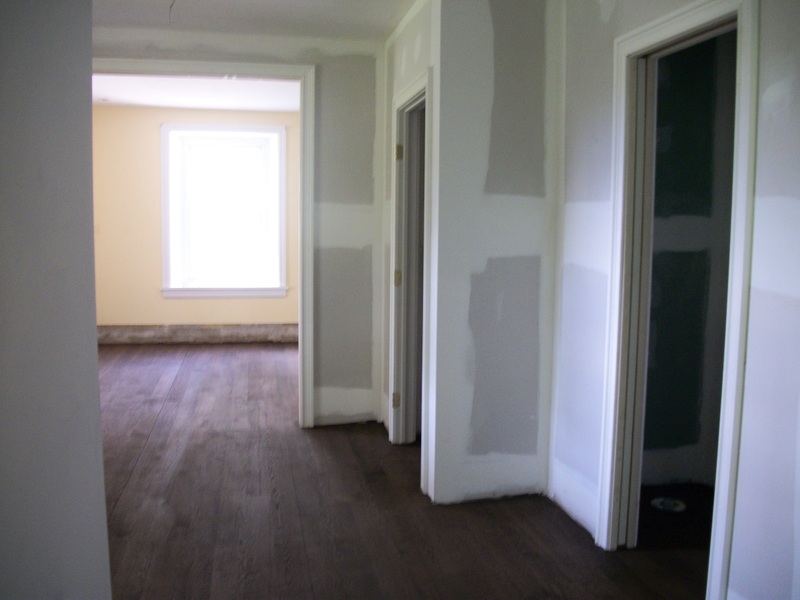 Once the flooring was finished, the house felt fresh and young again. 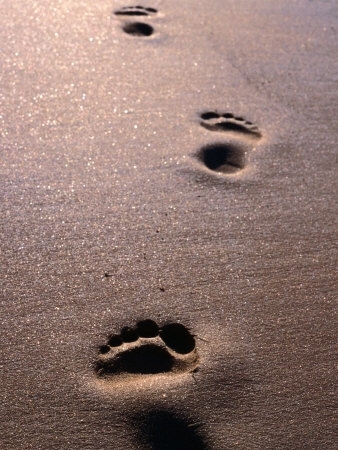 It is a new beginning for everyone!